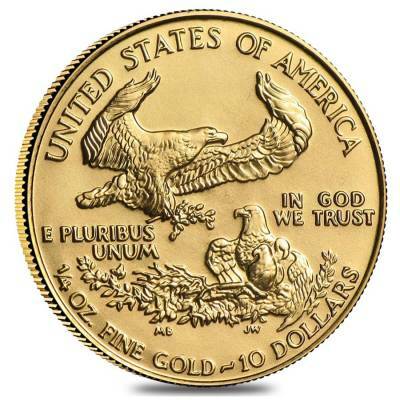 Since its first mintage in 1986, the American Eagle Gold Bullion coins have gained immense popularity as these coins are valued for collection and liquidity. 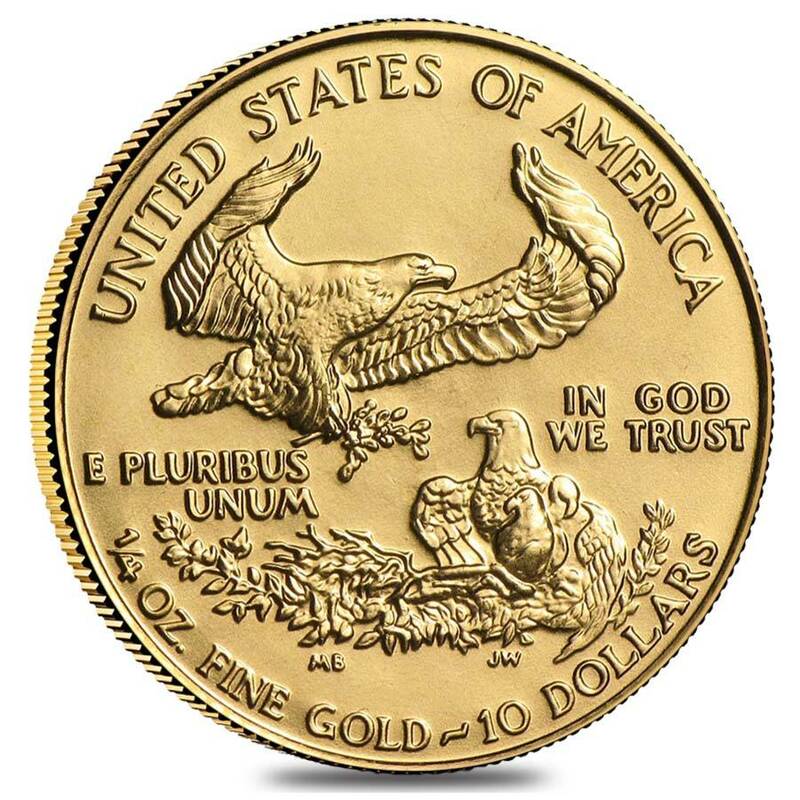 They are the legal tender bullions authorized by U.S. Government and backed for their weight, content, and purity by the U.S. Mint, where these American Eagle gold coins are minted every year. They come in four sizes; 1 oz, ½ oz, ¼ oz, and 1/10 oz. Per the 1985 Gold Bullion Act, the gold for these coins are mined only from the American mines. Contains actual gold weight of 1/4 Troy Ounce with purity of .9167. Obverse: A full length image of Lady Liberty walking forward with torch in right hand and olive branch in left hand against the rising sun and Capitol building in the background, an Augusts Saint-Gaudens’ design. Reverse: A Miley Busiek design of a male eagle holding an olive branch in his talons is flying towards the nest which contains a female eagle and her hatchlings. Item will be wrapped and packaged safe for delivery. Authorized by U.S. Government, hence easy to buy and sell. A small percent of silver and copper alloy in the 22 Karat coin makes it strong and durable to wear and tear thereby increasing its resale value. 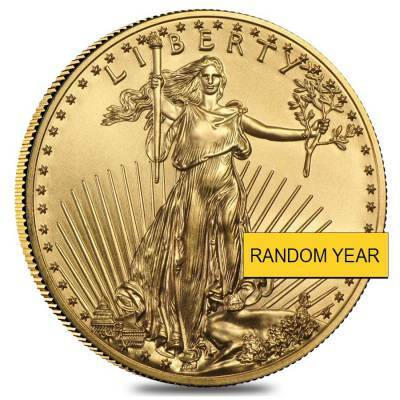 ¼ oz American Eagle gold coin is a more affordable option compared to their more expensive bigger denominations. Helps in diversifying and stabilizing your investment portfolio. Exactly as described! Thank you for the great service! I received my gold eagle this morning, and I must say it was packaged so well. Great job BE! Thank you so much. Very professional and timely! I recommend shopping with Bullion Exchanges, become a BULLIONAIRE! Everything as described. Very happy. Coins were carefully packaged and came without any marks. Beautiful coin! good price for the 1/4 oz. GAE. random. this is by far my best experience with purchasing coins online and I am very happy with the services. will come back! Ordered this 1/4 ozt GAE Random Year from several vendors, and BE has the best price, good order fulfillment, and great packaging. Most important was the coin being in true BU condition. Very satisfied and will definitely order again in the near future. Ordered three american eagle two days ago and received today. The coins came in a very good packaging, having no scratch.Thanks! Bullion Exchanges gave me a great customer service experience. I got my order placed quickly and shipped the same day. I can't wait for my next order! All these coins are beautiful. Bought these for investment purposes and these coins are recognized world wide. BE really does have competitive pricing I don't see my self purchasing from someone else. I've been ordering one of these every other week for about two months now and I have never had an issue receiving my coins. They always come very well protected and quickly. Thank you. Wow! Great quality, and exactly as described. The way you packaged it was impressive,thanks! With this purchase, you earn 347 Bullionaire Bucks 347 BB = $0.35. We currently have 983 of this item in stock. For every $1 spend, you will earn 1 Bullionaire Buck which is equivalent to $0.001 off a future purchase. 347 BB = $0.35.